At the end of last week, I was having a very frustrating day quilting on my longarm. It seemed like no matter what I did, I was only able to quilt for an inch before having my upper thread break. After trying to get restarted on my quilt several times, I knew it was time to take a deep breath and begin to seriously troubleshoot what was going on. Today, I want to walk through my basic thread breakage troubleshooting steps and talk about a unique solution I found for my problem. As a quick background, I piece and quilt almost exclusively with 50wt Aurifil thread. Until quite recently, I had a very picky sewing machine and after buying and testing a lot of different thread, I found that it sewed and quilted the best with 50wt Aurifil. My longarm happily quilts using 50wt Aurifil as well, so maintaining one type of thread in my “inventory” made sense to me. Aurifil has wonderful customer service and is dedicated to the quilting community, so I feel great continuing to use their thread. Also, I do take care to dust my longarm bobbin case after each bobbin and oil the bobbin case before getting started each day. When I see frayed thread (like the image above), I can usually pretty quickly trace back to something that I did to create the problem. If my needle goes up and down in the same location repeatedly because I am not moving quickly enough, I am very likely to fray the thread. Conversely, if I am moving along too quickly, I can break my thread with a quick transition from moving left to right and reversing to moving right to left. Completely re-thread the machine top thread. As I re-thread the top thread, I take my time to check all the surfaces that the thread is running / rubbing against. Is there a burr or anything sharp that I can fix? Re-thread the bobbin and dust the bobbin case. Check the bobbin to see if the needle has crashed against it leaving any sharp burrs and replace if necessary. Change the needle and repeat steps 1 through 3. Take the bobbin out and really clean and evaluate the hook (on my particular long arm the hook is easy to access). Make sure that there are no sharp edges or burrs on the hook or the case for the bobbin. Repeat steps 1 through 3. Change out thread to see if the thread is the issue. Repeat steps 1 through 3. If all these steps fail to solve the problem, take a time out and come back later. Once I have had a break, I will usually find that I was in a rush and skipped one of these steps, thus finding and fixing the problem. What I found last week was that a particular spool of 50wt Aurifil was the problem. The thread worked well in the bobbin, but when that particular spool was used as the upper thread, it was very brittle and would snap quickly. The break was so clean that I could re-thread my needle without trimming, which will hopefully be an indication to me of a thread issue in the future. Because I am using 4 different quilting thread colors on this particular project, I just changed to a different colored thread and kept making progress while I kept mulling the problem over in my mind. I made a quick order of a new spool of the thread color I was having difficulty with, and I kept quilting. I want to pause here to note another reality of any manufacturer’s thread: darker thread colors can be more susceptible to being brittle than lighter thread colors. This is due to the amount of dye and the process required to make / dye the thread. In my specific case from last week, the thread color I was using was very light and I used a darker thread to test out my machine which worked just fine. This gave me confidence that the issue really was with my thread and not the machine. As I continued to quilt, I had an idea. It was a hair-brained idea for sure, but I figured, what have I got to lose? If my thread was brittle, would humidifying the thread a bit help at all? My experiment was set up in much the same way that I would let dough rise, but on a smaller scale. I put 8-10 ounces of water in a microwave safe glass and let the microwave run on high until I could see the water boiling. 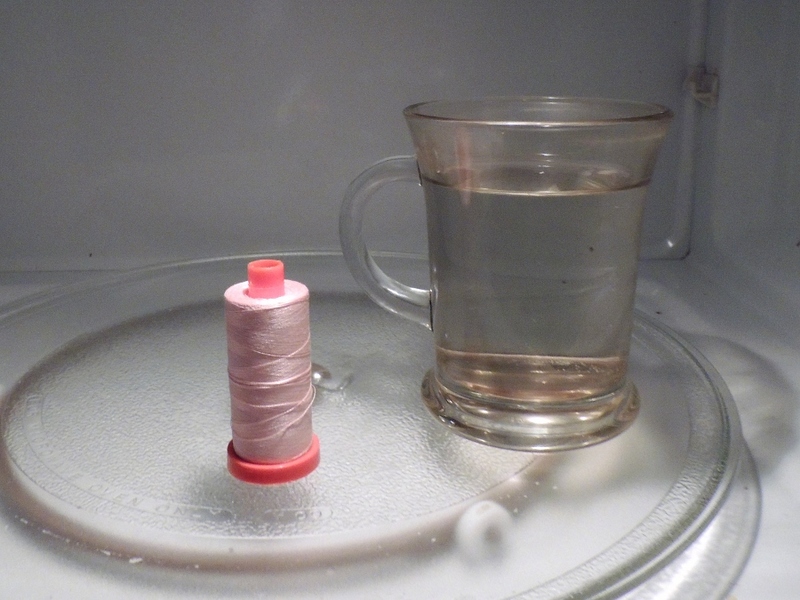 I then placed the thread inside the microwave (beside the cup of water; not in the water) and left the thread closed in the microwave for about 3 hours. The 3 hours was not a magical time – it was just how long it was in the microwave while I cooked dinner, went on a walk, and then had a moment to take it out and try quilting with it again. I am thrilled to report that my thread humidifying experiment worked! I was able to finish quilting the area I was working on with the spool of thread without a thread breakage. I do live in the very dry desert southwest, so I do not know if this solution will work for everyone who has this kind of brittle thread issue. I also have no way of knowing if the thread was just extra brittle in a localized area and perhaps if I had continued to try the thread without my humidifying experiment it would have worked as well. However, I do want to mention this experiment in case it might be something that would help you out in the future! 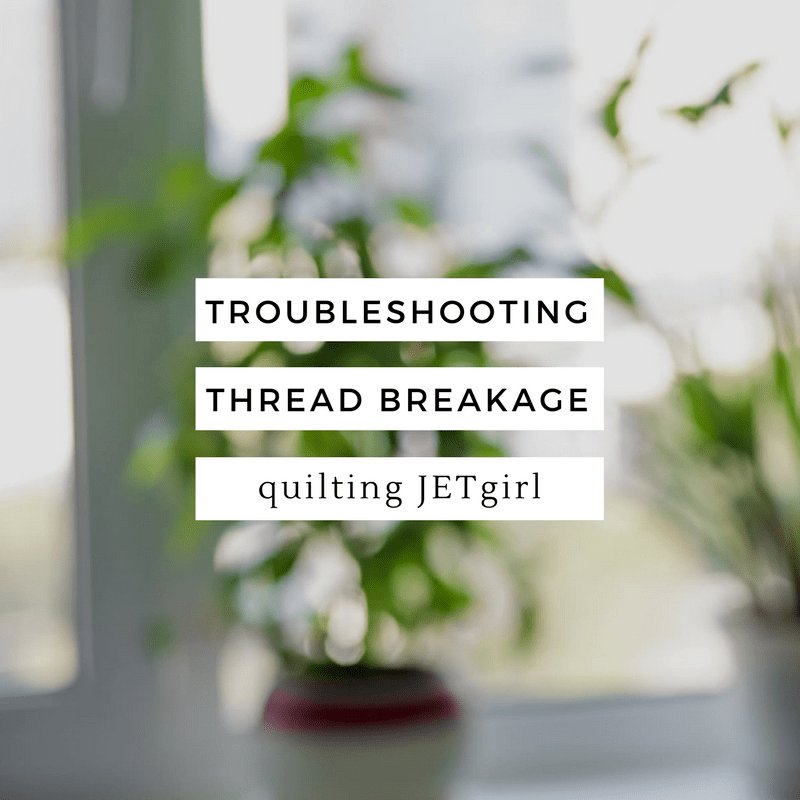 What do you do when you have repeated thread breakage issues? Are there troubleshooting steps you take that I have left out? Have you ever tried something like my thread humidifying experiment with success? The comments, as usual, are a treasure trove of additional great advice. I am moving the additional suggestions to be in the body of the post and giving attribute so that it will be easier to find in the future. Linking up with Tips and Tutorials Tuesday. It’s very interesting! It would help someone! This might be kind of embarrassing to admit but once when I was first doing FMQ on my machine, I had put in my needle backwards in my machine (turned 180 degrees) and the “wrong” side of the needle provided just enough bad tension to wear the thread so that it would end up snapping every ten inches or so. Since then I’ve been very diligent about putting my needle in the right way! What a creative solution, Yvonne! I would never have thought of that. Such an interesting experiment Yvonne. I live in the dry desert, too, and will have to keep this in mind. I use predominantly Aurifil (my machine is not fond of other threads) so if I encounter the problem, I;ll be sure to try your experiment. Thank you for these tips. I quilt with a tabletop machine, but experience the same frustration with my Aurifil thread. Fortunately, I have done steps 1-7 and still will have a breakage. When it is real bad, I coat the needle with liquid silicone. Sometimes it helps sometimes not. Always looking for help. Great tip, Yvonne! I never would have thought of that. We aren’t quite as deserty dry as where you are, but still pretty dry. Kudos on your problem solving abilities! Persistence and patience (taking a break from the problem) usually pay off. It’s a lesson I’d like to pass on to my grandchildren! One other important thing is to measure your bobbin tension. If it is too tight it will break the upper thread. I resisted getting a Towa gauge for a long time, but since I have been using one, my breakage problems have ceased, and almost totally ceased! Set the bobbin every time you wind a new one or change the thickness of the bobbin thread. Superior Threads recommend a tension of 170-180 for their Bottom Line, which I use a lot. I have found that tension number works in my machine for almost every thread I use. I have to adjust the bobbin tension looser for thicker threads and tighter for Aurfil or Bottom Line, and the gauge takes the guesswork out. The only thing that gets me now is dry brittle thread, like you talked about. I’ll have to try your technique of humidifying the cone I know is bad. I generally quilt with Aurifil myself, but I have some beautiful variegated Valdini threads that I like use if the project is right. 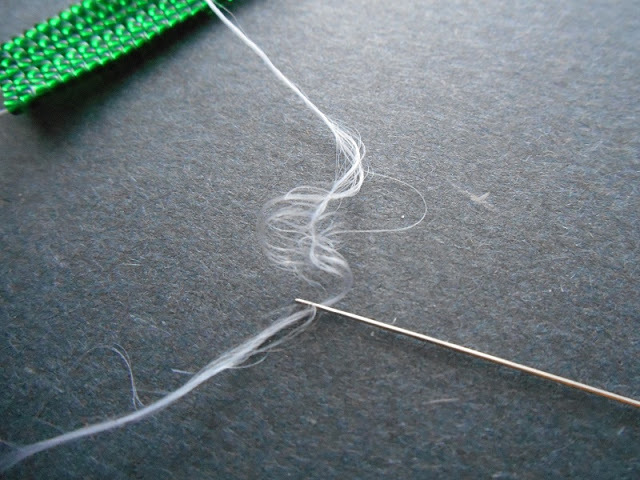 I have found if I use a bigger needle like a top stitch, in a larger size, that can help my thread breakage too. This is so creative Yvonne. I never would have thought to try this. I’m glad it worked for you. Excellent tips! When you’re sewing on your regular machine (not longarm), turn the machine off and on after rethreading. Kind of like rebooting your computer. Wow, that’s awesome! I’m glad it worked SO well! I’ve had thread breakage problems in the past but I usually narrowed it down to tension settings or the needle I was using. Thank you for the tip on thread humidification. I find that usually retreating my machine (domestic) and cleaning the bobbin area takes care of the problem. If it doesn’t, I change needles. Interesting. Thanks for sharing your findings. Of course I don’t live in your climate, but what a novel idea to humidify your thread! Love quilting with Superior Omni or Fil Tec Glide thread in my upper (both are trilobal polyester)..Never had a thread break ever, much less lint than cotton too. My Innova dealer also recommended the manga glide bobbins which are a pleasure . Excellent experiment! I would not have thought about the moisture content of the thread, but it really makes sense. The funny thing is a thread retailer over here once advised me to actually soak my thread in water enough to get it slightly damp when I complained about thread breakage. At the time I thought it was just a sales gimmick but I tried it and it worked! So now that I’ve seen your post I guess it does make sense. Thanks for sharing! Great article. All very sound advice and loved your tip about rehydrating the thread. I was telling myself that as I live in soggy UK that wouldn’t be an issue for me then I realised that my thread box rests against a radiator so I’m guessing it could very well be a problem!! When I had nightmare thread breakage problems with FMQ (only) on my DSM, every few inches like you, I did most of what you said although not as disciplined…. but then it struck me that the machine hadn’t been serviced for 2 1/2 years. So in it went expecting a major problem. My lovely engineer gently pointed out that whilst I regularly de fluffed where I could reach, my Pfaff needed a proper professional deep ‘de fluff’ regularily as with quilting there is so much fluff from the wadding. His view was that thread produced a certain amount of the fluff but the wadding was the main culprit. I haven’t read much on blog land about regular servicing. I know your issues were on a long arm perhaps de fluffing it routinely and thoroughly is easier rather than relying on a regular service. I use the liquid silicone on the thread spool. I draw several lines of it from the top to bottom around the spool before threading the machine. I repeat this after using several layers of thread, maybe 1/4 to 1/3 way down the quilt, depending on the size of quilt. Sharon Schamber recommends immersion of the whole spool in silicone and letting it dry. I’ve done that too but drawing the lines works and you don’t have to buy it by the gallon. I spoke with some ladies at the APQS booth at a quilt show recently and they said to keep Aurifil thread inside a plastic bag in the fridge so it doesn’t dry out. I’ve not used Aurifil in a while because it doesn’t play well with my domestic machine, but am planning to try it in the longarm to see how they get along, so will give this tip a try. You really are a trouble shooter and problem solver! Who would have ever thought to re-hydrate their thread?! I’m glad you solved the issue and can get back to quilting. Can’t wait to see this dense, dense quilting! Such a timely post! I’m having thread breakage problems with Aurifil 50 wt. white, which I’m using in my domestic Bernina for piecing. I’ve re-threaded, changed the needle, cleaned/dusted/oiled the machine & bobbin case, and made sure the thread spool is positioned in the correct orientation. I’ll try adding humidity – we’re having an unusual dry/low humidity spell here lately, so maybe that will help. Thanks for all the tips! What a great thing to know – although we don’t have a microwave it’s great to hear what other ideas quilters come up with to overcome problems. What type of longarm do you have Yvonne? Yvonne, this was a very informative post including some of the comments you included when you updated it. I don’t use a longarm but knowing more about thread is definitely useful. Thanks for your continuing contributions to the quilting community. Take care, Mary. Great tips. I never would have thought to experiment with the humidity of the thread but it makes perfect sense. Great feedback/suggestions from your readers as well. Well, I never would have thought of that! I’m so glad it worked for you. We generally don’t deal with low humidity here, but I’ll definitely keep this in mind just in case it comes in handy.